If someone asks you what your wristband means, you tell them. But will they remember after you’ve gone? Wouldn’t it be good to give them a lasting reminder? These attractive credit card sized message cards are just what you need. They set out the symbols and explain them in just a few words. You could give one away to someone as a follow up to a conversation or simply leave it to be picked up by, for example, your waiter or someone in the doctor’s waiting room.We would encourage you to add your name and phone number to the card (with your parents’ permission if you are under 18) so that the recipient can keep in touch.You get a Small Message Card with every wristband you buy. 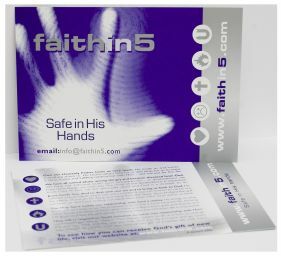 But why not buy additional cards – with the wristband on, you’ll be getting into lots of discussions about your faith! 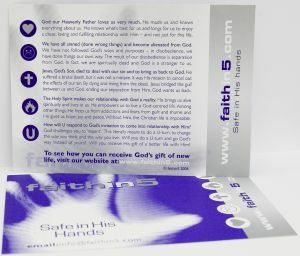 By giving one away, for just a few pence you can leave God’s good news with someone.You can buy a single pack of 10 cards. But if you buy ten packs, we’ll add an eleventh pack for FREE to your order. 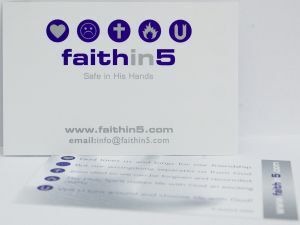 These striking postcard-sized Message cards explain the 5 symbols on the wristband in more detail. You get a Large Message Card with every wristband you buy. But why not buy additional cards, to give away to people who really show some interest? 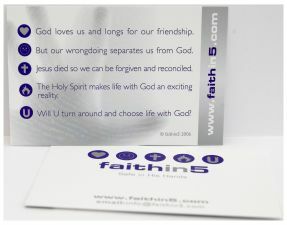 Hopefully, they will find the more detailed explanation really helpful.You can buy a single pack of 5 cards. But if you buy ten packs, we’ll add an eleventh pack for FREE to your order.